The traditions of the Eastern shore take a fresh and delectable turn at Emily's Produce. This roadside farm market near Cambridge serves up the vibrant colors, rich flavors, and fresh baked scents of shore life through the spring, summer, and fall. 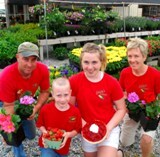 Emily's is owned and operated by a family that has been farming in the heart of the Chesapeake for 5 generations. The family's focus is always on fresh, natural products and ingredients. All of the fruits, vegetables, and flowers are grown right on the family farm. The market's prepared foods - desserts, breads, soups, and more are recipes passed down for generations. The market also offers a selection of great local products from other farms including cheese, meats, and ice creams. Emily's is more than a farm market - it's an Eastern Shore experience. Allow the children to play in the unique play area while you sit and enjoy the rural atmosphere. You can even head into the fields and pick your own produce, from spring strawberries to Halloween pumpkins.